Thanks to a post from Loyalty Traveler we were alerted to some good business class fares out of the U.S. and possibly Canadian cities to Germany. 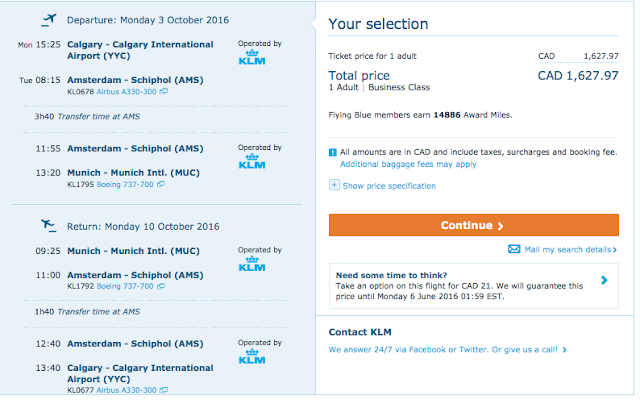 We dug deeper and KLM is definitely selling flights for a remarkable price! From late August right through to March of 2017 weekday flights are pricing below $17000 between Calgary and Germany, in Business Class! Check out fares and book online at KLM.ca. In some cases these are even cheaper than Economy Class! We're not sure how long this will last so I would jump on this right away! Calgary - Munich in October for $1,627!